Processing can affect the integrity of a nut’s health benefits. Pre-shelled nuts aren’t as healthy as nuts in their natural casing because natural fats and oils are more exposed and can break down and become rancid. Lots of salt and sugar will also compromise the health benefits of nuts, and cholesterol-lowering and weight-loss benefits will only be realized if other sources of fat and calories are reduced in the diet. 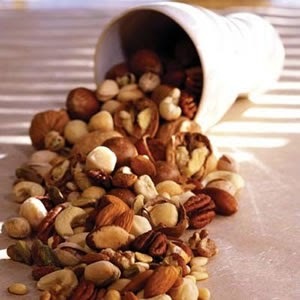 Nuts should substitute for a portion of unhealthier sources of fat and calories: not complement them. Roasted nuts are decidedly unhealthy because they are often processed in hydrogenated or partially hydrogenated oils—the harmful fat source.